Use in fully manual or the semi-automated "Slice window" mode which automatically remembers the start and finish position of the slice. This New entry-level Microtome is perfect for techniques such as histology, organotypic slice culture and low resolution imaging with a fixed blade holder and a mechanism Z axis error of ≈ 5-8µm. Specialized Ceramic blades for Campden Vibrating Microtomes. These blades are honed with a single bevel for superior slicing. Specialist Blade Technology for Campden Vibrating Microtomes. Temperature controlled cooling baths for the 7000smz-2, 5000mz-2, 5100-Plus and 5100mz vibrotomes with a controllable temperature range of approx +10ºC to 0ºC with accuracy of ± 1 ºC. For experiments where exact control of a low slicing temperature is required. A magnifying glass for general global slices offering approximately 1.5x magnification. 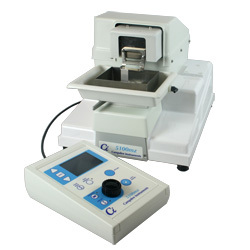 Integral cold light powered directly via the Model 5100mz Vibrating Microtome. Optional kit to upgrade the 5100mz to the 5100mz-Plus. Allowing the user to optimally calibrate the Z-axis deflection of the blade to 2±0.1 µm.